I hear heart crushing stories all the time. If you’ve found me, more than likely you’ve experienced a loss that’s rocked your world or has broken your heart. You struggle with images and the pain wondering if it will ever get better. Your sleep patterns are all messed up. You don’t feel like eating or you can’t get enough to eat to fill the emptiness and void. You may be staying busy but at the end of the day, the pain is still there. No one sees or feels what it’s like for you. Your isolated and people don’t want to rehash the story of what happened or your struggle with it because it’s too depressing. And sadly, you’ve lost the energy you once had for those you love. The grieving experience can also be caused by a move, becoming an empty nester or the loss of health, career or faith. A huge loss for many is that of their childhood or innocence. Being stuck in the grieving experience is often caused by a lack of good information…. People often say things proving they have no insight into how you feel and they say time heals all wounds. In reality time time does not heal, it simply passes while you’ve gotten good at pretending you’re okay. You’ve learned to say, “I’m fine” when you really aren’t. Here’s the deal…People can be empathetic but never know how you feel. You are unique, and your situation is unique. Your story is unique. Even though loss IS a natural part of life, what people learn about loss is not natural and most often, not helpful. The truth is, it’s rare someone can say something that is comforting or useful. People say, “You should focus on being grateful for what you have.” That hasn’t worked because while being grateful is a great mindset skill, it has nothing to do with the actions necessary to heal your heart. 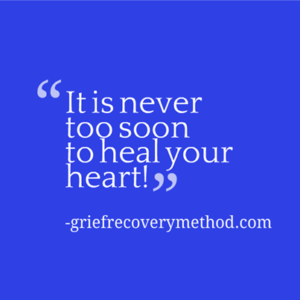 What does healing your heart or getting beyond the loss even mean? Recalling and enjoying memories without them turning painful. Having the energy to care for yourself and those you love. Being present to get the most out of the time you have. Having a story of loss that no longer defines who you are. & Having the skills to deal with loss directly. I am a Certified Grief Recovery Specialist. I am also a Certified Holistic Health Coach (CHHC) and graduate of the Advanced Transformation Coaching Method (TCM) facilitated by the Health Coach Institute. Prior to becoming a Grief Recovery Specialist and Life Coach, I spent 28 years within the Technology Industry. I have been married for over 21 years and have three living adult children (ages 30, 28 and 25.) My husband and I have his & her sons from our first marriages and a daughter we took custody of when she was 15, she is now the oldest. My oldest son, would be 32 coming up but unfortunately died at the age of seventeen after being diagnosed with a neuro-degenerative disease 14 month earlier. Grieving became even more difficult when my youngest son lost his Dad at the age of thirteen, 3 years after his big brother died. Aside from formal education, I have years of experience in working through my own loss events. I bring insight from an array of life experiences starting at a young age. Overcoming obstacles and creating success has been my life-long journey. Like many of you, there have been times I couldn’t catch a break. Losing my son was the most intense grieving experience and frankly, had it not been for others that needed me, I thought my life might as well be over because I didn’t want to live the rest of my life in so much pain. The world believes “People never get over the loss of a child” which includes the endless pain that wells up in your chest. I have found that not to be true. If you are a parent that’s lost a child, the information I teach and the support I provide, can help you. It helps not only with the physical loss of your child but the many intangible losses that come with the ending of a life way too soon. You CAN learn to grieve in a healthy way. It took me a long time to find the right t really get through to the other side of the most intense pain in my life. You can smile again and create a life with purpose. I know it’s possible because I have. I am a mother whose has lost a son and many others. Working with me, you learn to move beyond your own losses and get better at supporting others experiencing grief from loss. You CAN get more present in your life instead of being stuck somewhere between depression and anxiety. You have a choice to stay where you are…. work with me or someone else that can help. Moving forward IS a choice. If you do not choose to work with me, I hope you choose to work with someone. To move beyond loss, it has been proven over, and over again, the correct skills and support is necessary. Otherwise, most people just keep themselves distracted with food, addictions, or trying to stay busy. We try in creative way to convince ourselves we are okay when we really aren’t. The second is to work with me one on one. Working with me one on one is good for you if you are interested in exclusivity, you are not interested in a group experience or feel you can achieve more healing with undivided attention. If you are willing to make the investment and commitment to dive into your own experience and make some changes, this may be the best fit for you. Because of the nature of grief, I work with people after we have had time to discuss your unique circumstance. If you are ready to schedule a call, there’s no cost to you for the call or visit my Grief Recovery page. We will talk about your unique experience with grief or what’s going on currently. We will clarify what would most help you to feel better and discuss best next steps to get there. Then, if you want to work with me and you are a good fit for one of my programs, I will invite you to become one of my new clients. If for some reason, we are not a fit, I have resource to many people within this field that may better support you. We can figure that out and I will make sure you have some supportive information to take away from the call. I discovered I wouldn’t invest in myself but would my new born son. Learning to heal your own heart and life experience is the only way to teach your own children how to deal with the challenges they face. Otherwise, they will follow your example. Down deep, I think all of us know being strong, staying busy, sitting isolated waiting for life to be magically better doesn’t work. The right information, a system and support can make the difference when nothing else can.